One of Washington, DC’s hottest condo developments is the Flats at Union Row—an adaptive reuse project that is combined with the Warehouses at Union Row. These sister developments were shepherded by PN Hoffman and born out of old commercial warehouses. The Flats represent the most modern element in the community—a curvilinear eight-story complex presenting walls of glass, and some brick as well. 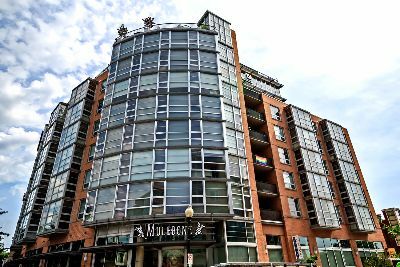 Located at 2125 14th Street in DC’s exciting U Street Corridor, the Flats at Union Row were delivered in 2007. This pet-friendly structure offers 208 residential units plus ground floor retail. The project is bordered by V and W Streets to the north and south, with a wide brick walkway and overhead catwalks serving to bridge the next-door Warehouse residences. Condos for sale at the Flats are offered in a wide range of floor plans, from studios to top-of-the-line two bedroom and den penthouses. And while ‘Flats’ are generally indicative of single-floor styles, the larger two-bedroom models actually come in loft layouts with super cool steel staircases. 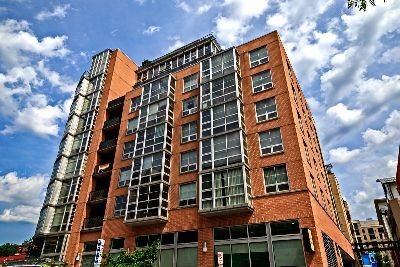 List prices in this ultra-trendy building have recently ranged from around $400,000 to the million dollar range. Inside, you’ll find open designs, massive window walls that must be seen to be appreciated, maple hardwood floors and exposed ductwork. The elongated modern kitchens run along one wall, with maple cabinets, stainless steel appliances and granite counters. The granite-top serving bars are minimalist and open below, adding to a European ambiance. Penthouse city homes also have private terraces. Life at the Flats at Union Row is nothing if not luxurious and self-sustaining. The uber-modern lobbies are staffed twenty-four/seven with front desk and concierge. There’s also parking and a bike room, and a wonderful party room with fireplace, media and a bar. Plus there’s a rooftop terrace with a fireplace, commercial-grade grilles, and a terrific view of the city. There’s also a Yes! Organic Grocery and CVS on the ground floor. But if you ever tire of being a hermit in your opulent condo community, you’ll find a wealth of nearby amenities, including some of the hottest bars and restaurants in DC, both along the U Street Corridor and running north on 14th Street. Among these are Saloon, the Brixton, the Gibson, the Codmother, Fainting Goat, Lost Society, Marvin—do we really need to continue? Also, the U Street Metro is steps away.